Take Highway 400 427 404 south to Highway 401. Take the Highway 401 E to Kennedy Road N exit 379. As you come off, the hotel is on the right-hand side. Take Highway 407 E to Kennedy Road S.
Delta Toronto East is conveniently located at Kennedy Road and Highway 401, with expressway access from Pearson International 20 minutes, and central downtown Toronto 20 minutes. Close to shopping, Toronto Zoo, Ontario Science Centre and Paramount Canada's Wonderland. East Toronto is a new and dynamic business hub. 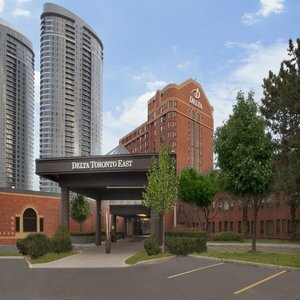 And no other hotel is better placed to offer the outstanding business services and facilities you expect than Delta Toronto East. Located just off Highway 401, it's also close to the area's greatest attractions, such as the Toronto Zoo, Ontario Science Centre and fantastic shopping. For Business or pleasure, it's the perfect destination. Take Highway 401 E to Kennedy Road north. North on Kennedy Road and the hotel is on the northeast corner on the right hand side. Take Highway 401 W to Kennedy Road north exit 379. Exit West side, the hotel is on the northeast corner on the right-hand side.